The most formal of evening wear. Very few of us will ever need to dress at this level so don’t stress. State dinners, diplomatic functions and very formal charity balls. Women: Ornate ball gowns, upswept hair, long gloves, even tiaras are worn. Men: Black tailcoat, white evening waistcoat, white bow tie. Weddings, gala dinners, charity balls, opening nights, year end functions. Women: Floor length evening dress. Sophisticated and elegant. No plunging necklines or daredevil slits. Men: Tuxedos/smoking/dinner jackets in black or white. A fly front or ruffled dress shirt with white or red silk handkerchief in pocket, cuff links. A cummerbund to cover the area where the shirt tucks into the pants. Black bow tie. Ethnic dress is also appropriate. Weddings, gala dinners, year end functions. 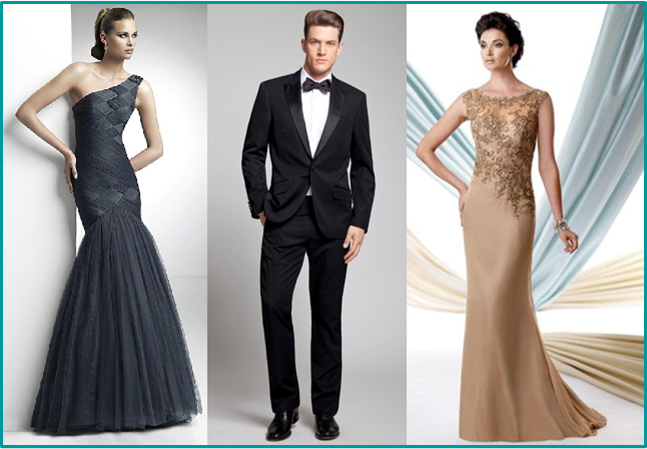 Women: Don’t waste this wonderful occasion by going in a plain frock–turn on the GLITZ. Floor length evening dress. Glamorous, red carpet at the Oscar’s stuff! Men: Black tie as above or dark suit worn with white shirt, luxurious evening tie in black or bold colour. Year–end functions, cocktail parties, business dinners. Women: Knee length or just above the knee cocktail dresses-the style and colour of the dress is dictated by the formality of event. A classic – the little black dress (LBD). Optional: skirt with a glitzy or chiffon top. Men: Dark to mid tone suit, colour or white collared shirt and tie. Shirts and ties can have a print, be textured, have a shee or be in colour. Less formal year–end parties, business lunches or dinners. Women: Tailored dresses–from a-lined, to a shift dress. 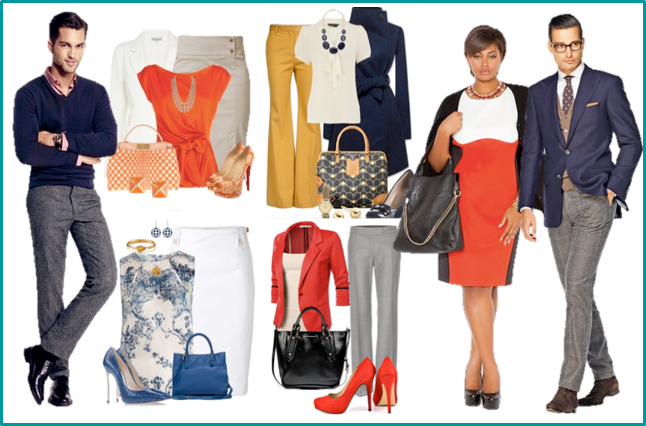 Tailored solid colour pants, glamorised with a blouse, bling top or collared tailored blouse. Skirts at or above the knee. Optional – jackets. Costume jewellery, statement shoes, clutch bags are a good option. Men: Gabardine, cotton or wool pants combined with a long sleeve shirt. Colours and pattern can be bolder than previous dress codes. A blazer and tie is optional. Functions include relaxed dinners, corporate get– a– ways, lazy summer braais and picnics. Women: Dark jeans, casual pants, capri pants, soft fabric skirts, casual dresses. Men: Chino’s, casual pants or dark jeans. Soft collared shirts, golfers, good quality cotton t–shirts. 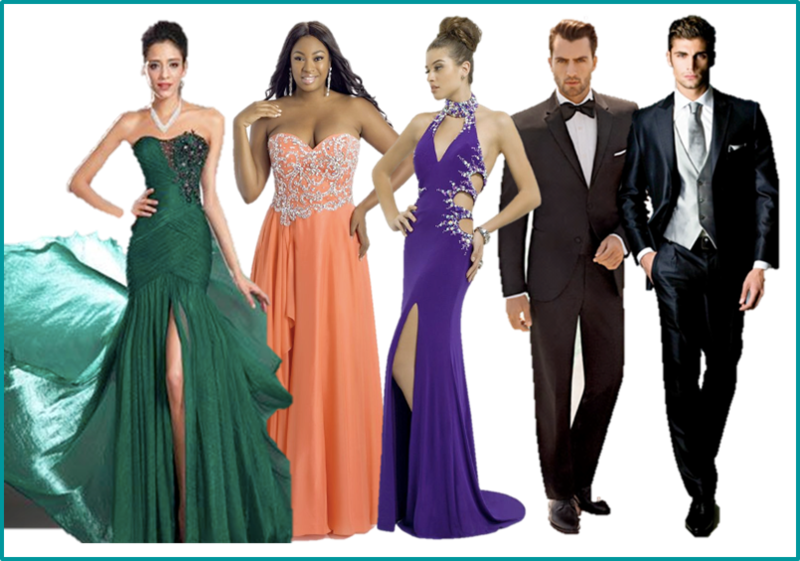 So now you know all about dress codes for different formal occasions – enjoy and mingle. If you are concerned about your networking or conversation skills, click here for tips on the art of small talk. 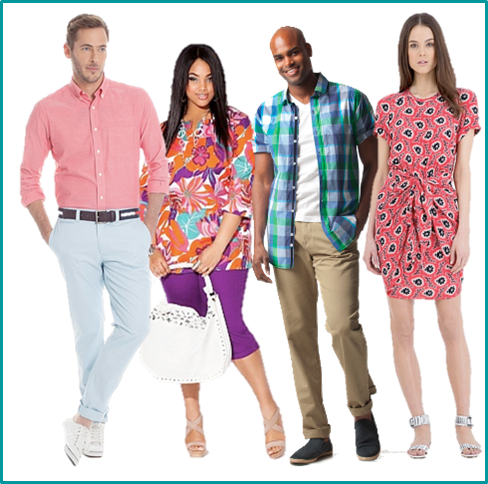 If your company needs a modern yet appropriate dress code specific to the culture of the organization contact us at info@profimpressions.com. Comments Off on What should I wear to the party?